Migration is not new. In recent decades however, human mobility has increased in numbers and scope and has helped fuel a global shift in the human population from predominantly rural to urban. Migration overall is a livelihood, investment and resilience strategy. It is affected by changes across multiple sectors and at varying scales and is affected by macro policies, transnational networks, regional conditions, local demands, political and social relations, household options and individual desires. 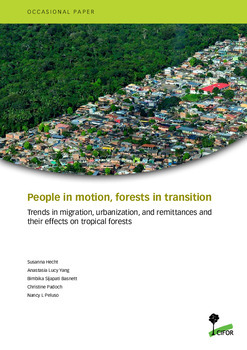 Such enhanced mobility, changes in populations and communities in both sending and receiving areas, and the remittances that mobility generates, are key elements of current transitions that have both direct and indirect consequences for forests. 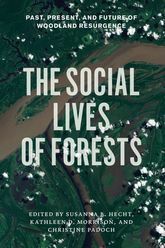 Because migration processes engage with rural populations and spaces in the tropics, they inevitably affect forest resources through changes in use and management. Yet links between forests and migration have been overlooked too often in the literature on migration as well as in discussions about forest-based livelihoods. 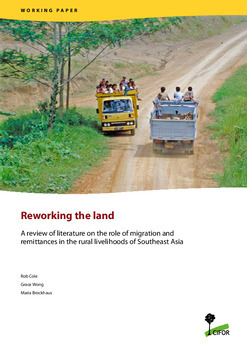 With a focus on landscapes that include tropical forests, this paper explores trends and diversities in the ways in which migration, urbanization and personal remittances affect rural livelihoods and forests. Authors: Hecht, S.B. ; Yang, A.L. ; Sijapati Basnett, B.; Padoch, C.; Peluso, N.L.